Early to rise and late to bed. I'd wake up at the crack of dawn and surf wherever the waves are good! After catching some waves I’d head to Taco Surf in Pacific Beach to grab a burrito. I always keep golf clubs in the back of the truck, so I would then drive over to Torrey Pines golf course, a US Open Championship course only 10 minutes away. Then time in San Diego only gets even better. Ideally, a limo would pick me and the OEX crew at my place and we'd head to Donavan’s downtown for a steak dinner. To top it all off, I'd have drinks at Bootlegger and a game of bowling at East Village Tavern. Back to bed by 2:00 am (hopefully)! What is your favorite San Diego activity? Surfing hands down! But if the waves are flat, I grab a kayak and some scuba gear to dive the kelp forest in La Jolla. Good question. Six out of seven days I'd say burgers and beer. Of course on the seventh day I'd have to find a date to enjoy some good food and good wine. Empire of the Sun, Stick Figure and Otis Redding. Head to La Jolla Shores for a dive along the wall of La Jolla Canyon and witness the abundance of sea life unlike any other place in California. Add to that the constant reshaping of the canyon wall by the ocean and you have a fascinating area to dive whether you dive it once or several thousand times. 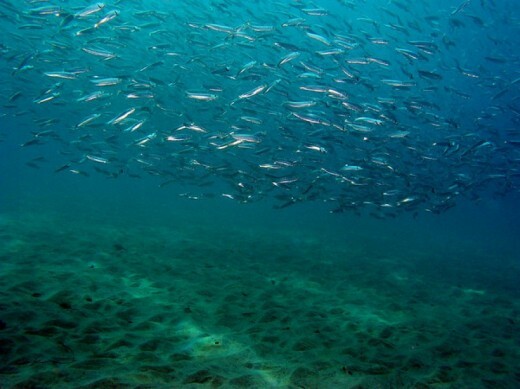 Below are a few highlights under the water of La Jolla Shores. Depending on where you enter the water, you can dive a site known locally as the Amphitheatre, where you’ll find a sheer, semi-circle wall that descends from approximately 60 feet down to a depth of 110 feet or thereabouts. At the South Wall, you’ll find tiny Red Octopus, holes filled with lobsters so thick they’re stacked on top of one another, and yellow and white Gorgonian Sea Fans. Vallecitos Point, a popular destination directly out from the entry point at the foot of Vallecitos Street, teams with marine life including San Diego Dorids, Salted Dorids and other Nudibranchs, Sarcastic Fringeheads, Blue Banded and Black Eyed Gobies, Barred Sand Bass, Painted Greenlings and the occasional Sheephead. For those possessing an Advanced Open Water diver certification or higher, there is the not so ‘Secret Garden‘ rich with Red Gorgonians. Have you been down the wall in La Jolla Canyon? If not, where is your favorite place to dive in San Diego? When the sun comes out this weekend there’s only one thing in San Diego that I want to do – kayak through the caves in La Jolla! These natural wonders are quickly becoming one of the most popular attractions in San Diego as thousands of locals and visitors paddle in wonder through these hidden gems every week. La Jolla Shore’s natural boat launch creates a perfect place for beginners and avid kayakers alike to start their adventure around the cove. After just a 20 minute paddle out from the boat launch, kayakers arrive at the famous La Jolla sea caves. Millions of waves and years have carved these north facing sea caves – including Big Rock, Arches, Emeralds, and Sunny Jim’s – out of the 75 million years old sandstone cliff side. 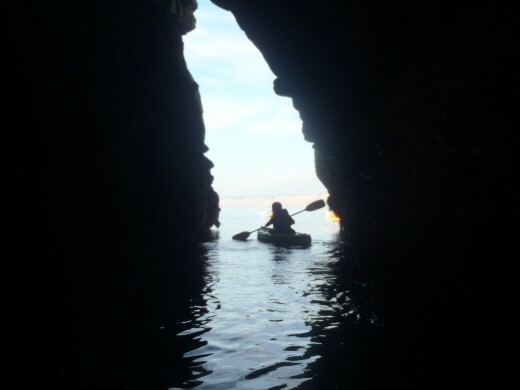 Kayaking or swimming through the reserve are the only ways to explore most of these caves, though Sunny Jim’s is the only known land accessible sea cave on the California coastline. 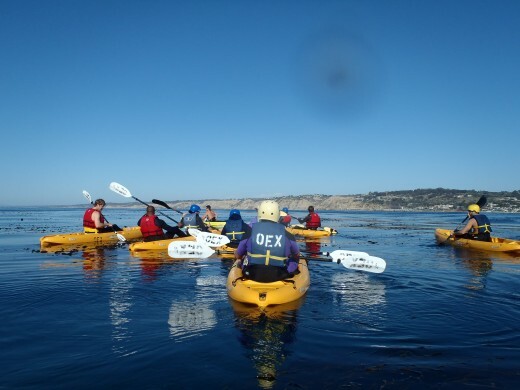 The famous caves aren’t the only thing you can expect when kayaking in La Jolla. Boasting some of the most condensed sea life in all of California, the La Jolla Environmental Protection Area and Underwater Ecological Park is home to dolphins, sea lions, harbor seals, girabaldi, sea turtles, leopard sharks and even gray whales! Being up close and personal with the wildlife is really what keeps myself and others coming back to the area time and time again. Just recently, I personally had a harbor seal swim underneath my kayak and proceeded to scratch himself on my boat and then try to grab another kayaker’s paddle! Since the area is inhabited with sea life and people alike, the wild animals have grown accustom to coming up close and personal. Lucky for them, the government protection allows them the freedom of curiosity! So what are you waiting for, grab (or rent) a kayak and get exploring. 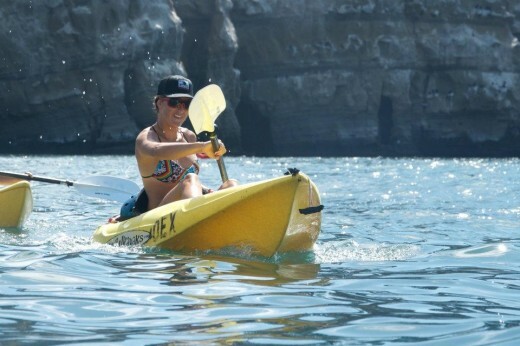 Tell us in the comments below, where is your kayaking hidden gem in San Diego?